Overloaded trucks are the major cause for road damage and represent a serious threat to traffic safety. CAT offers the entire range of products and systems for HGV (heavy goods vehicle) monitoring and enforcement of overweight vehicles. The most efficient method of axle load and gross weight measurement is carried out without affecting the traffic flow at all. 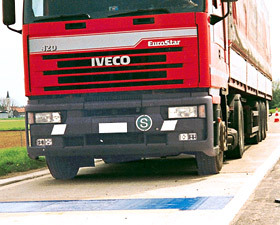 The so called High-Speed Weigh-in-Motion (HSWIM) system consist of road-embedded sensors, data processing electronics and communication modules. Low cost basic sensor configurations, e. g. for traffic data collection and statistics, may use one wheel load sensor only. High-end performance HSWIM systems with double line sensor configuration are able to achieve down to 5% gross weight error corresponding to COST-323 accuracy class A(5). With both sensor technologies excellent weighing results in slow and fast moving traffic can be achieved, assured by highly skilled and certified service technicians and system engineers. Due to its superior design the DAW 50 axle weighbridge achieves highly accurate truck weight data such as gross weight and axle load. 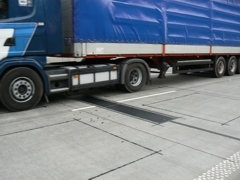 The weighbridge is PTB approved for static and dynamic operation and delivers most accurate data in both cases. 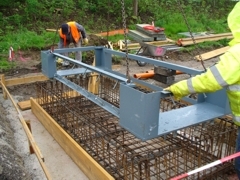 The platform stability of the so called Low-Speed Weigh-in-Motion (LSWIM) system is achieved by horizontal and longitudinal stabilizing rods and a rugged platform design. Because of the dynamic operating mode an efficient enforcement of overweight vehicles is guaranteed. The system is used within the context of weight enforcement by road authorities and police, fleet operation/management, harbor management, border control and toll systems.